就在轉向Chandalar Ranch 的斜坡上 , 駕駛Johnson突地轉頭跟大家說..... 車子卡住了！！卡住了.... 卡住了..... 卡住了......!! We moved on to stay in Chandalar Ranch , a famous northern light observation point and hostel , just in order to raise the probability of seeing northern light . But , on our way to Chandalar Ranch , the nasty weather made our "skating " possible . How slippery it is . Just right on the slope up to Chandalar Ranch ,Johnson suddenly turned to the rest of the group and said that " the car got stuck..... got stuck ......"
We soon got off and attempted to pull the car over , but failed . Chris and I ran all the way up to Chandalar Ranch for rescue . Chris and I got a scolding from the grandma of the ranch .just because we didn't shut the door flat . But , our fear soon disappeared as soon as we met the pretty female Taiwanese daughter-in-law. She asked us to come in first and left the stuck car alone for the time being untill her husband came back . So , we began to move our food and prepare our dinner as it was almost time . 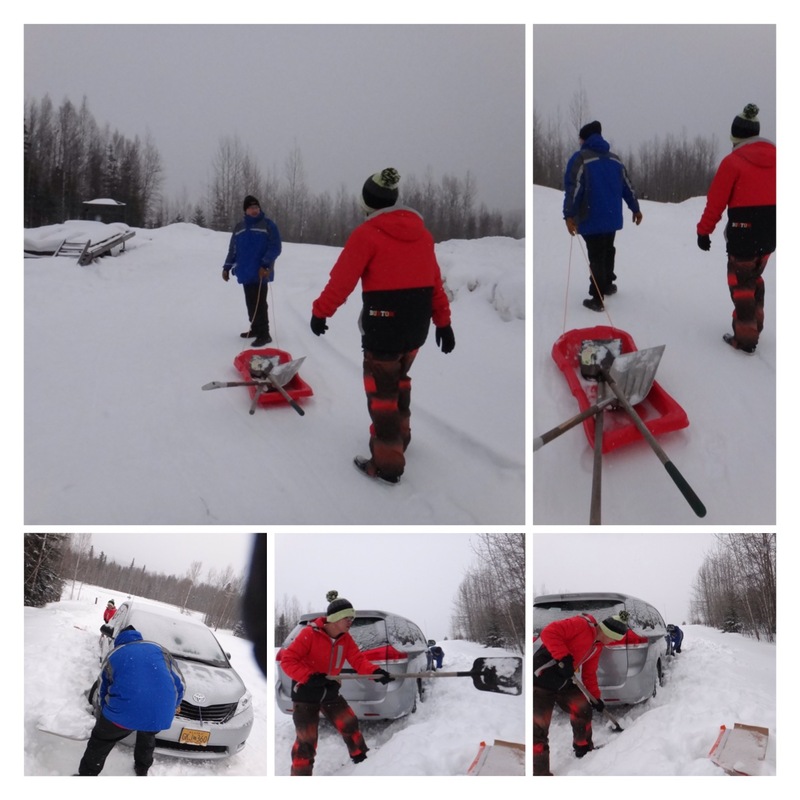 Johnson , Chris and I decided to get back again with three shovels , attempting to get our car out ! 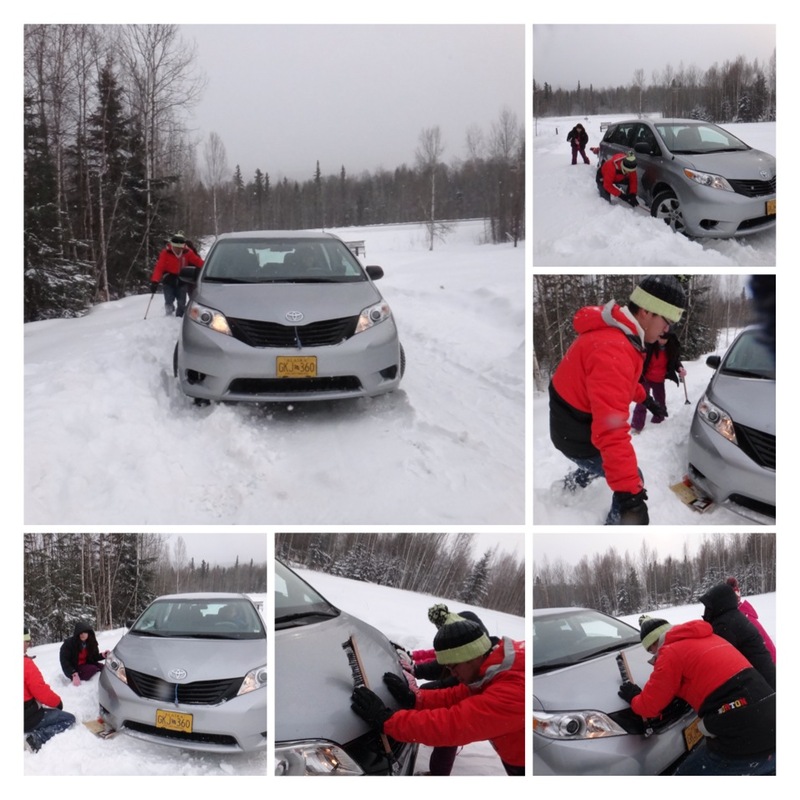 Next day , we were determined to go all the way northward , trying to step into the arctic circle , the so-called end of the world , via Dalton road . Getting on Dalton road ,along with the bad weather and our car getting stuck in the previous day , everybody's nerves were on edge . Every single one was worried but none spoke out . That might be the so-called bravery . Since the weather got worse ,plus an accident of a truck turning over took place ,adding our worry , we decided to pull a halt as we got to the middle of Dalton road , Yukon River . 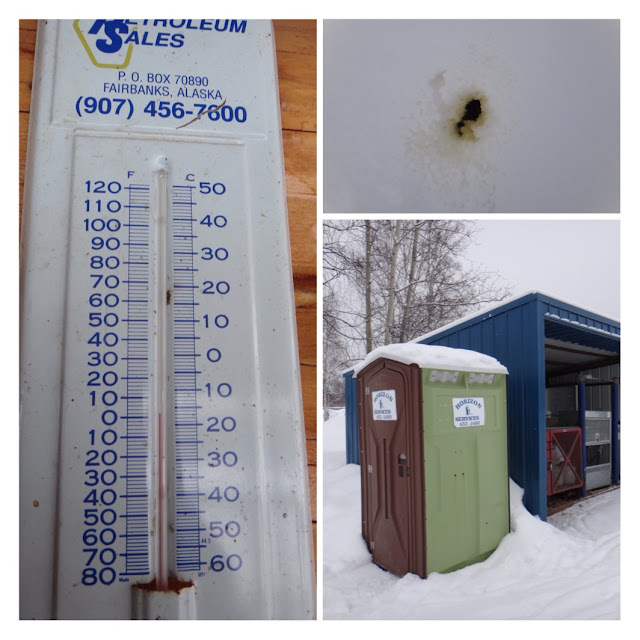 Even the gas station in Yukon River shut down in the winter . Just at the time when we took a rest , we met a group of dog sledder coming with a group of dogs .Those dogs are strong enough to sustain the freezing cold without wearing gore-tax . The most interesting thing to keep in mind is the female driver of the dog sled is also called "Amao " ( means Hope in their language ) . As for the meaning of my name in my language , it means "Thriving" . Same name , similar meaning , different language ,.So interesting to meet another Amao at the end of world . We are moving our food ! Hey man ! pls ! you even have time to play around ! Rescue A-Team . 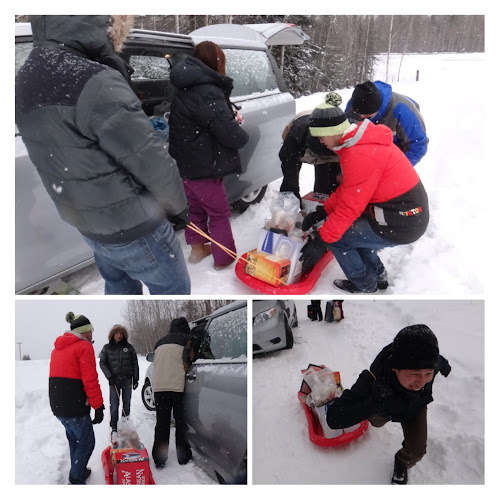 Get our car out ! The picture taken after we successfully got our job done . Wide-open view with a beautiful snow scene . it would be good to stay here all day long without doing anything . Refilling fuel at the last gas station before Dalton road prior to going all the way up . 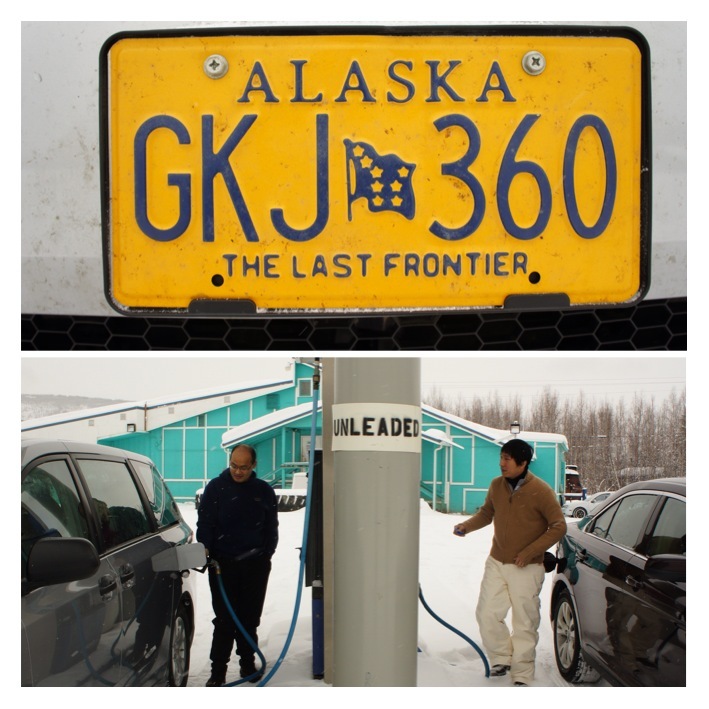 Just as the plate said , we are going to " the last Frontier "
Marking my footing by urinating and defecating would be more impressive . Silent silver and white world . Vitality in the frozen land . 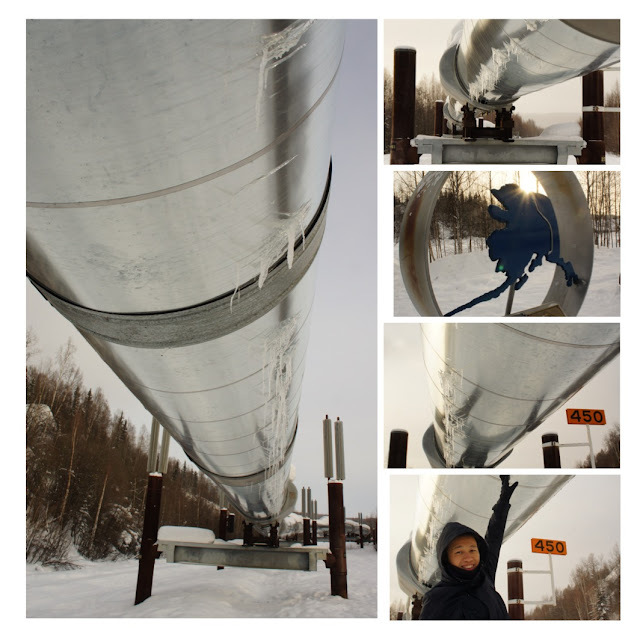 Alaska pipeline along the way . fast passing oil trucks are often seen . The sign of Yukon River just was seen after a half day's driving . Don't know why , The name ,Yukon River , has had a beyond description attractiveness to me. However, it is winter now , I have no chance to see what it looks like . Crossing Yukon ! The Yukon gas station just ahead . Holy Cow ! Shut down with no one over there . I thought there would be at least a Donkin donut over there . 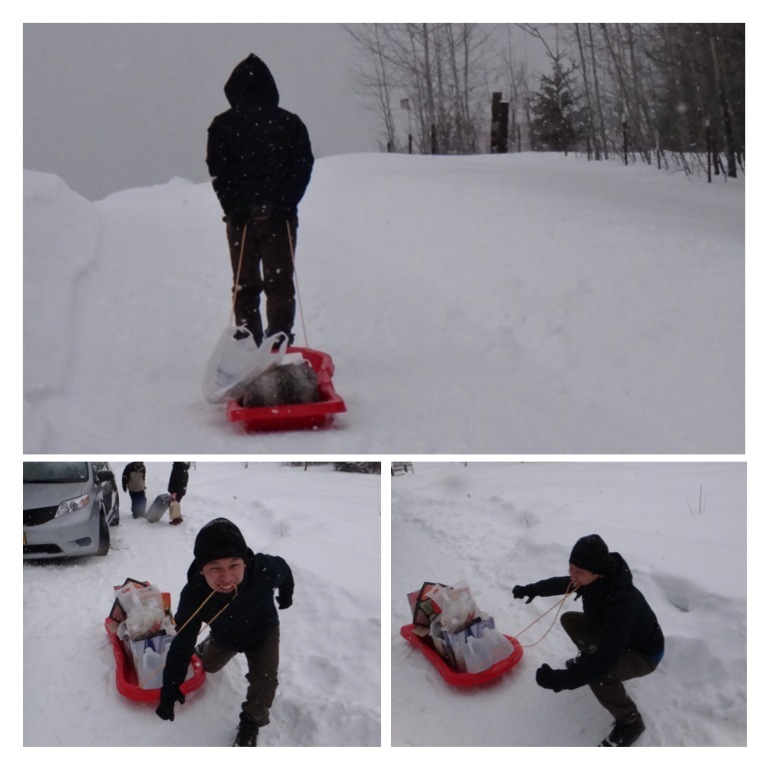 The dog sledder came to exchange some supplies with a friend . In the very beginning , I din't dare to touch them . Because the owner said they are likely to give the strangers a bite . However, we eventually found that our kindness can melt down those puppies ' heart . The leader of the dog group . usually held its position steady . They are waiting for lunch . See ! it looks better !? Let's welcome "doggy beauty "--Rebecca ! Female Amao !! So interesting to meet another Amao here ! We finally come closer to Alaska pipeline ! Can we drill a hole on it and bring some back home for sale ? 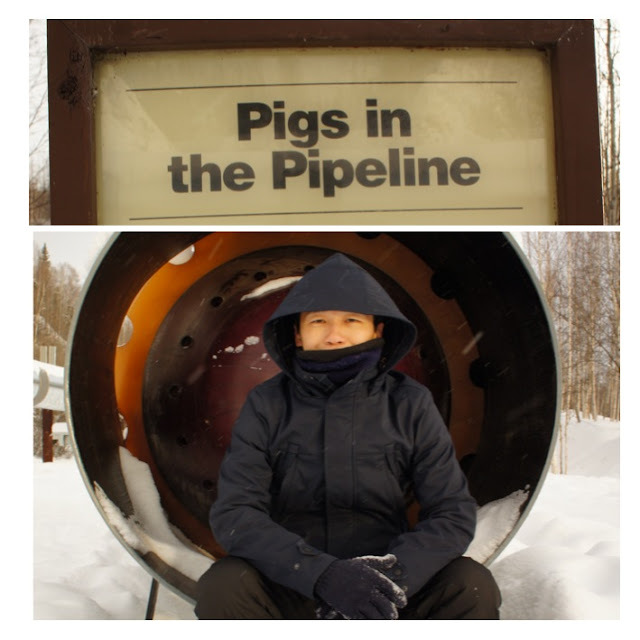 The reason why oil can keep flowing without being frozen , because there is a device called "Pigs" inside .